Jeff Bezos, the founder and chief executive of online retail giant Amazon, is now the world's richest person, according to Forbes magazine's annual billionaires list published Tuesday. 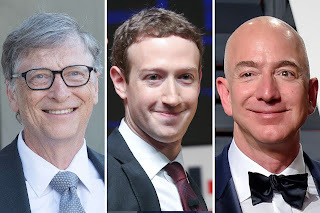 It was in October last year that the net worth of Jeff Bezos surpassed Microsoft co-founder Bill Gates' $90 billion, but this is the first time he has been named as richest person by the magazine. The fortune of Jeff Bezos went to $112 billion (roughly Rs. 7.27 lakh crores), according to Forbes, after Amazon stock's value rallied by 59 percent over the past 12 months. After the announcement, Jeff Bezos' worth rocketed again to $127 billion in line with a spike in Amazon stock, widening the gap between him and Gates. Legendary investor Warren Buffett held on to his number-three ranking, followed by French industrialist Bernard Arnault, who jumped to fourth-richest person from his previous number 11 spot, mostly thanks to euro strength against the dollar, the magazine said. Facebook's Mark Zuckerberg was fifth on the list. US President Donald Trump's ranking on the list fell to 766th place from 544th in the last edition, his wealth now being estimated at $3.1 billion (roughly Rs. 20,100 crores), $400 million less than a year ago. There are now a record 2,208 billionaires in the world, Forbes counted, and their combined worth is $9.1 trillion, up 18 percent from last year. The US has the most billionaires (585), followed by mainland China (373). Forbes' list contains 259 newcomers, including the first-ever cryptocurrency billionaires. Falling fortunes or political headwinds, meanwhile, pushed 121 people out of the illustrious list, including all 10 Saudi Arabians, the magazine said.